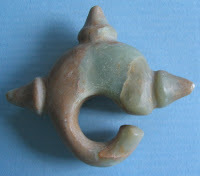 This funny shaped three pronged stone (maybe nephrite ) ornament was purchased from South Vietnam. 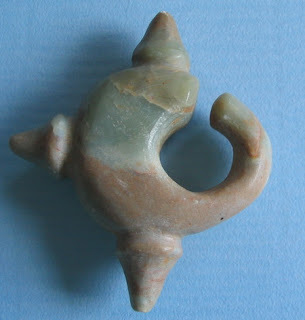 I think it belongs to the the nephrite earrings (sometimes called lingling-o) from the Sa Huynh Culture of Vietnam (1000 BC to 200 AD), a late prehistoric metal age society on the central coast of Viet Nam. However my specimen may not be genuine Sa Huynh. I somehow got the feeling that it is a replica. The seller being uneasy himself, had said that it is from the Champa Kingdom, a later civilization and that could bring it as far down as 1800. The curled up C-shaped ornament also reminds me of the Chinese Hongshan (3500 to 2000BC) zhulong(pig dragon.) 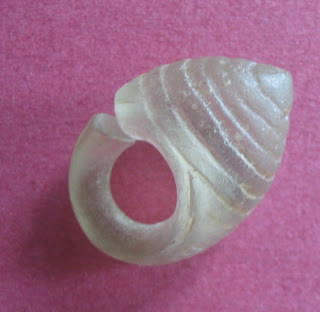 The zulong is descended from the jue(slit ring) and the jue-form is also used in Vietnam although later than the Chinese period. So from this chain of reasoning my impression that the lingling-o and zhulong are distant cousins, relatives or whatever, may not be too far fetched ! Though I must admit that my assumptions are completely unscientific ! The picture on the left is a lingling-o looking view (the earring view) usually shown in books and other sources. The picture on the right shows a different view. Does it not resemble the curled up zhulong ? Wish I could post a picture of a zhulong for comparison. Unfortunately, I do not own one not even a replica. However jade collectors would be familiar with this legendary artifact and the Net would also have many images of this illustrous mythical animal. Here is another C-shaped, lingling-o/zhulong lookalike ornament made from glass also purchased in Vietnam.